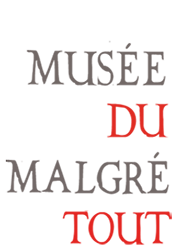 Besides the guided tours, the Musée du Malgré-Tout offers twenty or so workshops by reservation. Each one last one hour. 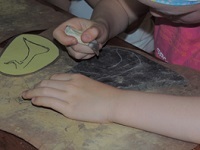 Some of them are workshops where the visitors create something and can therefore take it back home! Others (called activities) are more presentation, explanations, shows and discussions on a topic with sometimes small handling by the public. 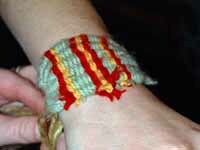 Making thanks to a wood frame of a fabric bracelet. 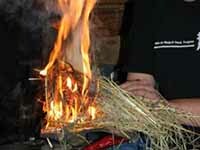 Discovery of different systems to produce fire used from Prehistory to nowadays. 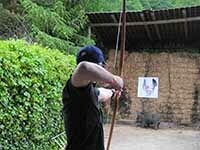 History, discovery and learning how to use a bow. 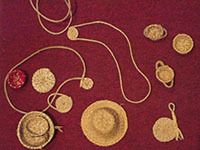 Discover the very ancient technique, combining sewing and organic fibres, to make a basket. 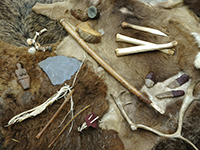 Introduction to the fibres and the weaving techniques used during Prehistory. 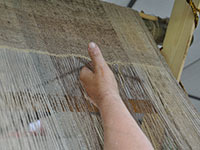 The group makes strings and weave them on a vertical loom with stones. Discover one of the prehistoric art by modelling animals and women figurines from clay. 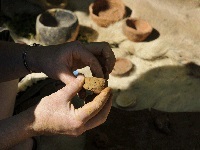 The finery art : making of a leather bracelet with a shell and a organic string, thanks to bone and flint tools. 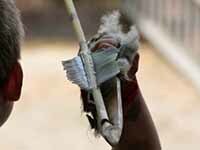 History, discovery and learning how to use a spear-thrower, the hunting weapon of our Palaeolithic ancestors. 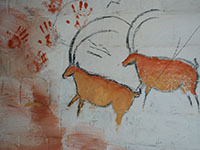 Cave art history : the drawing and painting techniques of prehistoric artists. 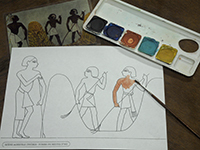 Creation of a drawing and colouring in the prehistoric way. Engraving with a flint like prehistoric humans a women's silhouette or a animal on a shale pad. 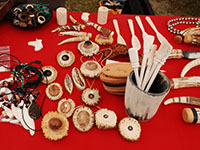 Wind instruments, stringed instruments, percussions, noisemakers are provided to everyone to discover the prehistoric sound. 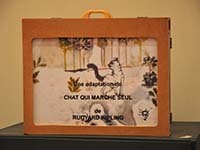 Adaptation from the Rudyard Kipling "cat who walked by himself". 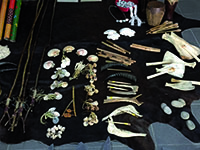 Introduction to the bone work techniques in the antique way. 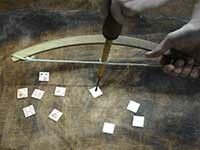 Application of bone work techniques by decorating a bone pad (this workshop has to be preceed by the activity). Introducing to the early Roman Empire monetary system. 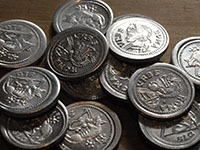 Demonstration of the warm minting of a coin. Everybody mint his own coin. 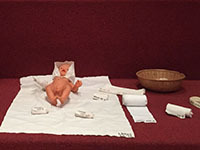 Reproduction, thanks to the advises of the antique midwives, of the babies swaddling methods during the roman times. Discover, while debating, how the Roman society threats newborns and children, from a social and religious point of view. 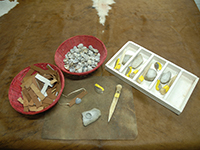 Introduction to the gallo-roman ceramic techniques and to the archaeologist work. 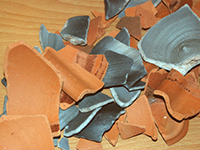 The participants recreate pots with shards. 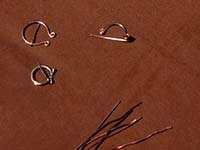 Introducing to an adornment invented during the Celtic period and largely spread during the gallo-roman times. Making of an omega type fibula. 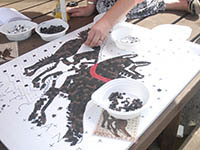 Introduction to the gallo-roman mosaic technique and making of a mosaic. 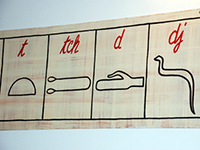 Discovery of the Pharao's writing. Everyone write his name with hieroglyphs. 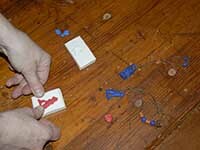 Introduction to the Egyptian believes through amulets and making of two lucky amulets. 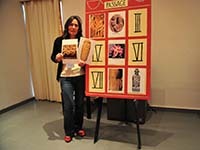 Showing of the Egyptian painting and his conventions. Application of these conventions on a chosen topic.